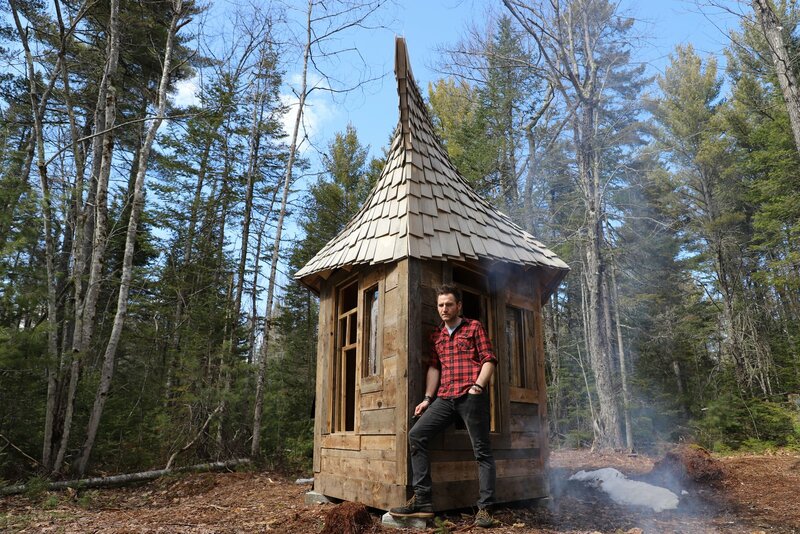 Designer and builder Jacob Witzling’s handcrafted cabins have a dreamy, fantastical quality that makes them truly one-of-a-kind. "I get my design inspiration from cabins of the past, from the world of fantasy both in movies and books, and in that childlike part of my imagination that I’m continually trying to preserve," says Jacob Witzling. Jason Witzling first fell in love with cabin life when he was 16 years old. In his last two years of high school in New Hampshire, 16-year-old Witzling lived in a 1920s cabin that was tucked away in the woods near his parent’s house. "I’d do laundry, shower and have dinner there before finding my way back to where I really lived," he says. 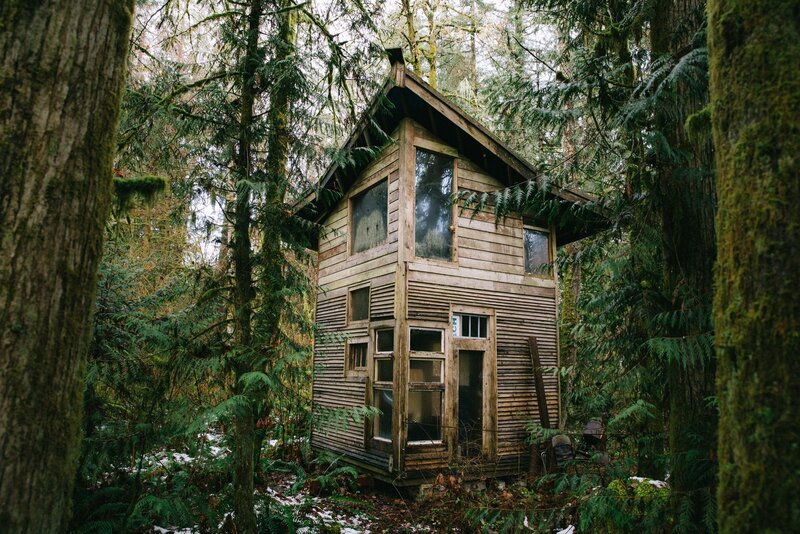 "Inside was a wood stove that I fed and stoked through the harsh winter nights. I had my freedom and my fire. They were all I needed to be happy." 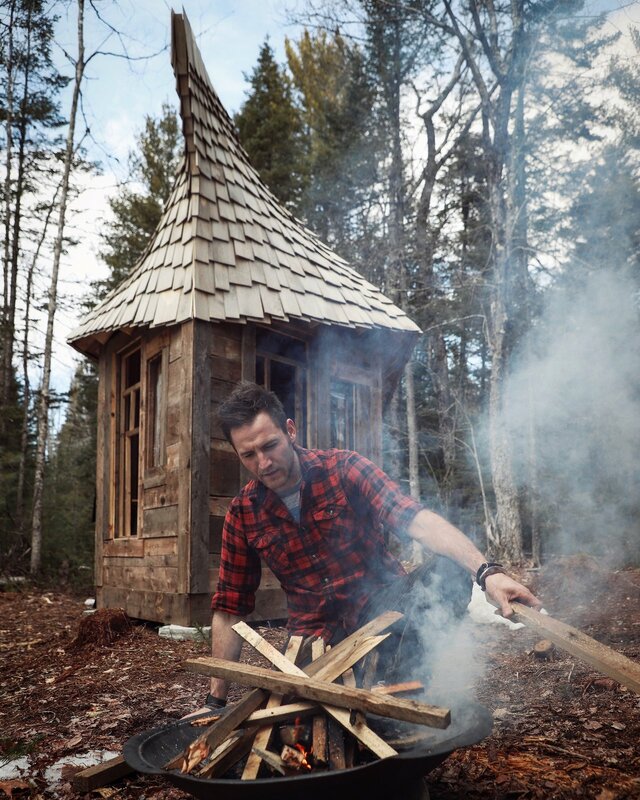 Witzling, a second-grade teacher, makes most of his cabins for friends and family. 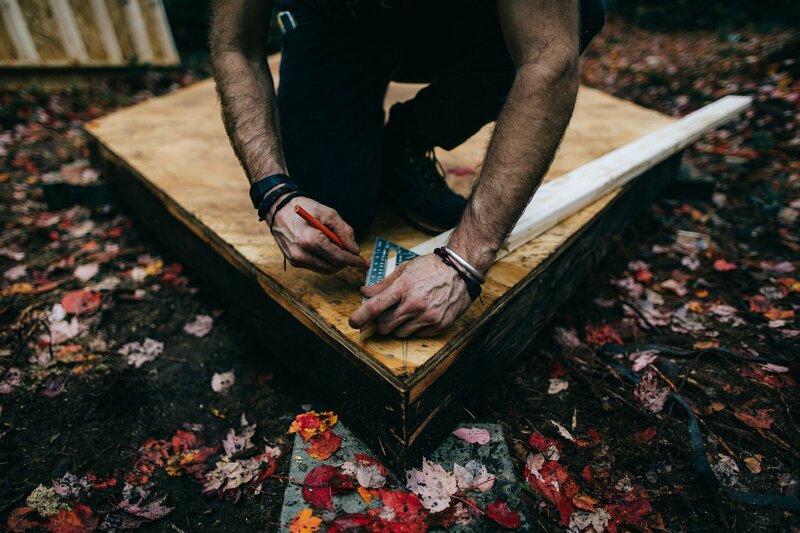 Fifteen years later, at 22, using scraps scavenged from construction sites and upcycled lumber, he built his very first cabin for just $800—and lived in it for the next three years. 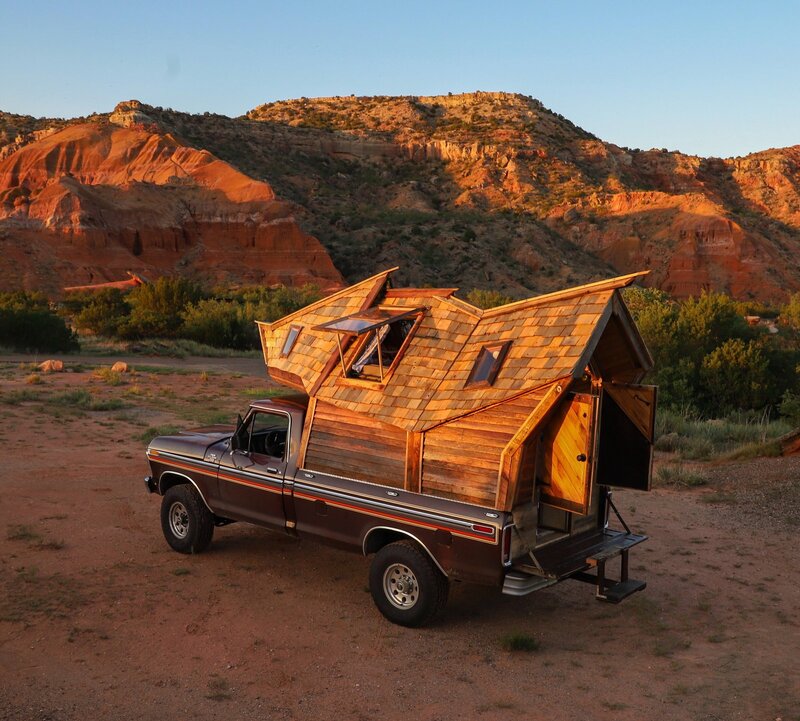 To date, Witzling, who is now 35, has built five one-of-a-kind cabins, and is currently driving his latest creation—a truck cabin—around the United States with his life partner, model and actress Sara Underwood. 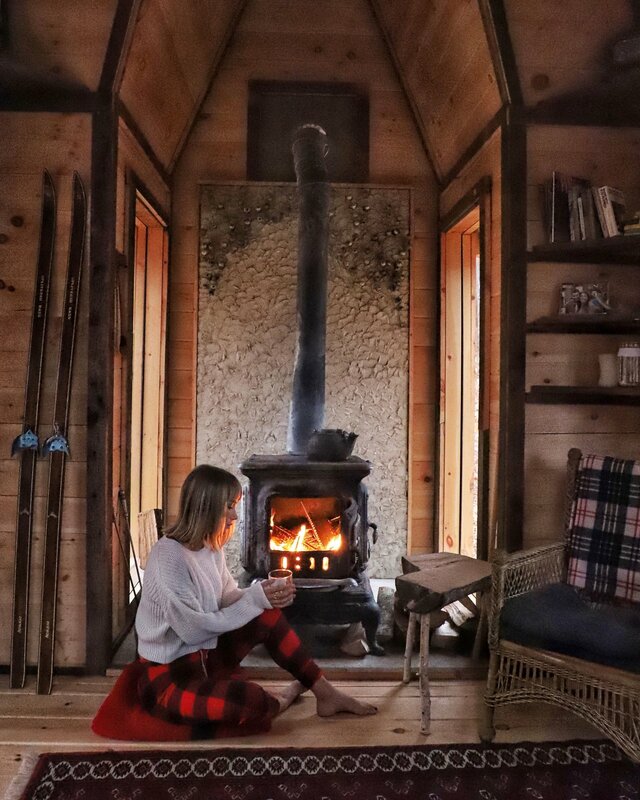 Sara Underwood relaxes by the fireplace in Witzling's fifth cabin. "I started building cabins because, like lots of kids, I loved forts and Ewoks," says Witzling, who recalls being captivated by his architect and engineer father’s favorite book, Handmade Houses: A Guide to the Woodbutcher’s Art. 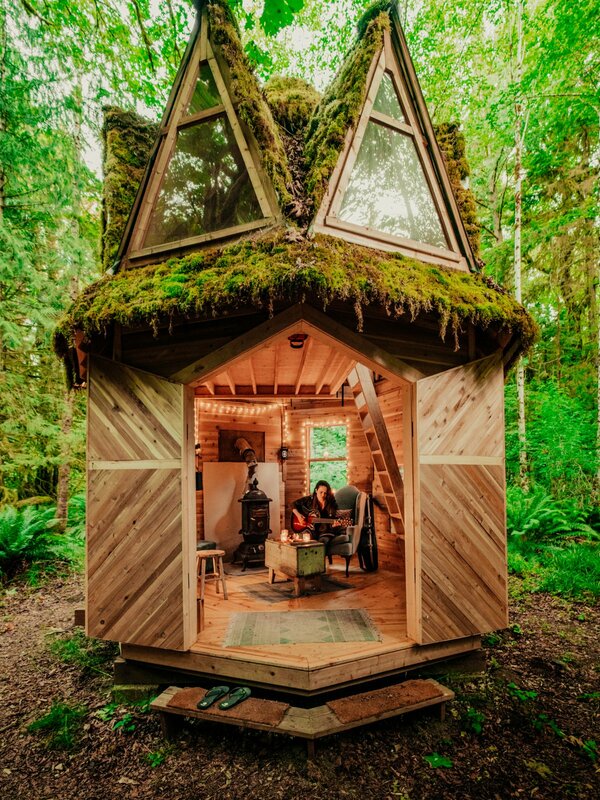 "I always wanted to live in a cool-looking fairy tale house, like a hobbit." 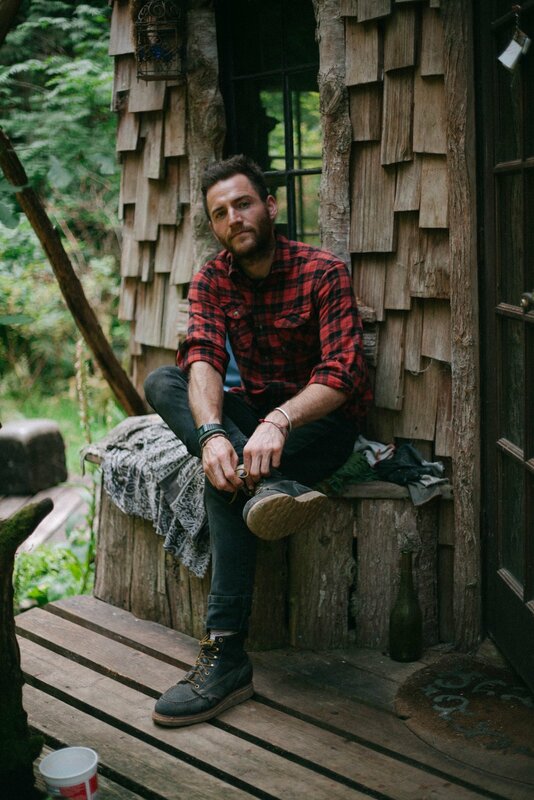 Cabin designer and builder Jacob Witzling found inspiration in his architect father and childhood fairy tales. Continues Witzling, "I read that as a kid, and imagined living in one of those houses myself someday. I would gaze at the pictures from inside my blanket fort, and daydream about building one of my own. The uniqueness and zero restriction of the handmade home is what inspires me to create these livable sculptures from sustainable and local materials." The welcoming interior features high ceilings. "I realized that they were not flawlessly constructed, and that if I tried, maybe I would be able to build one of my own," says Witzling. "I just needed the property." Serendipitously, his friends purchased a few acres of land near where he lived. 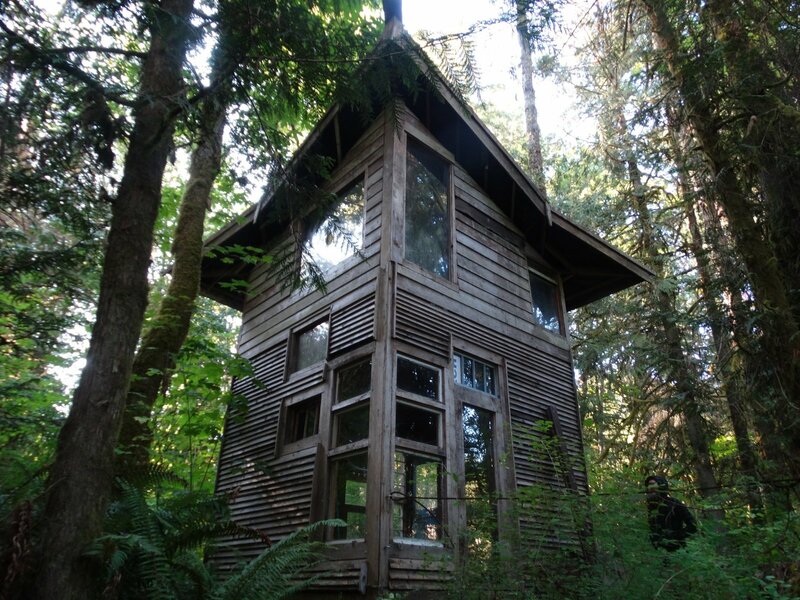 Witzling came up with a proposal they could not refuse—he would pay for the materials and labor to build a cabin on their property if they would let him live in it for three years after. His friends agreed, and Witzling’s first cabin project was underway. 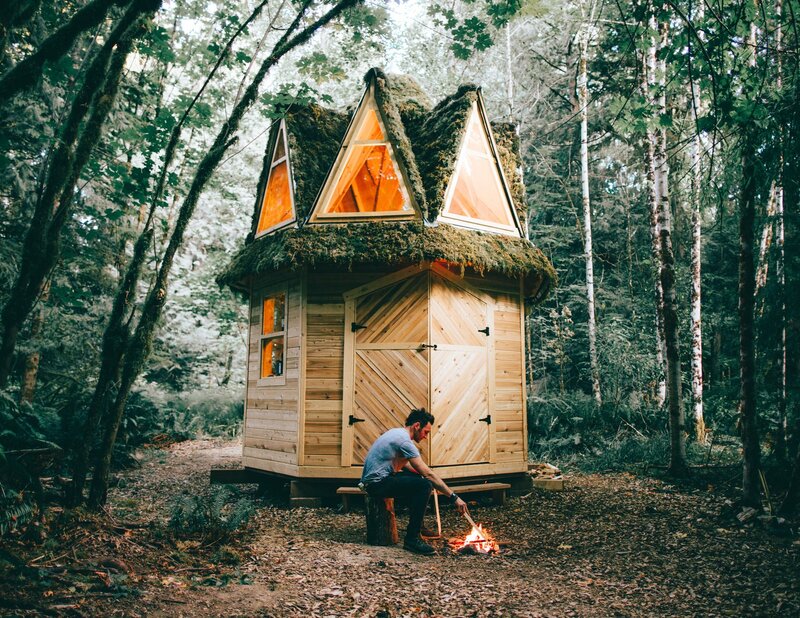 Today, Witzling still uses salvaged scraps from local lumber mills and building sites, as well as materials from nature—such as moss for roof cover—for his cabins. All of his homes are built off the electric grid, with no running water, and designed to be powered by a 12-volt D/C system using deep cycle batteries. Drinking, cooking, and bathing water is collected from a well, and a composting toilet is located in a separate outhouse structure. 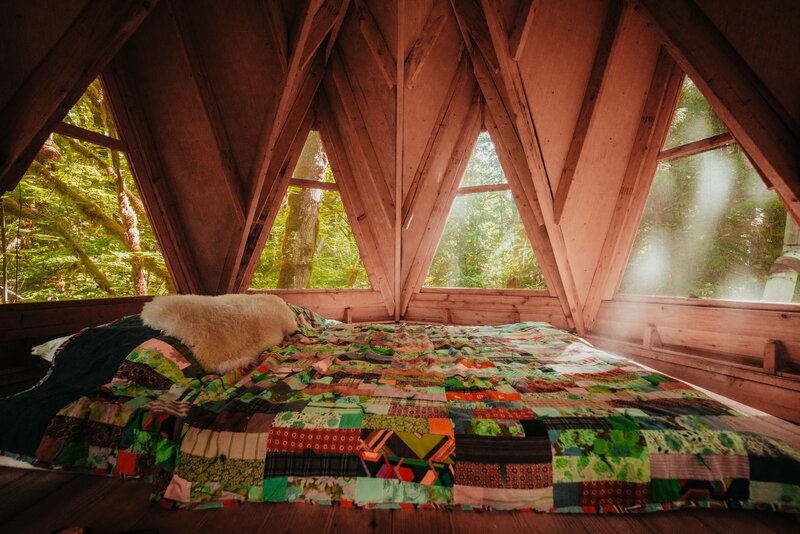 An octagonal cabin boasts a lofted sleeping area with views of the forest outside. Most of Witzling's cabins are built as a barter for land, similar to the arrangement under which he built his first: "I provide the labor in exchange for years of access after the completion of the structure. One cabin I built with my brother just for fun. My most recent cabin I built for friends, and the Truck Cabin was built just for Sara and myself." 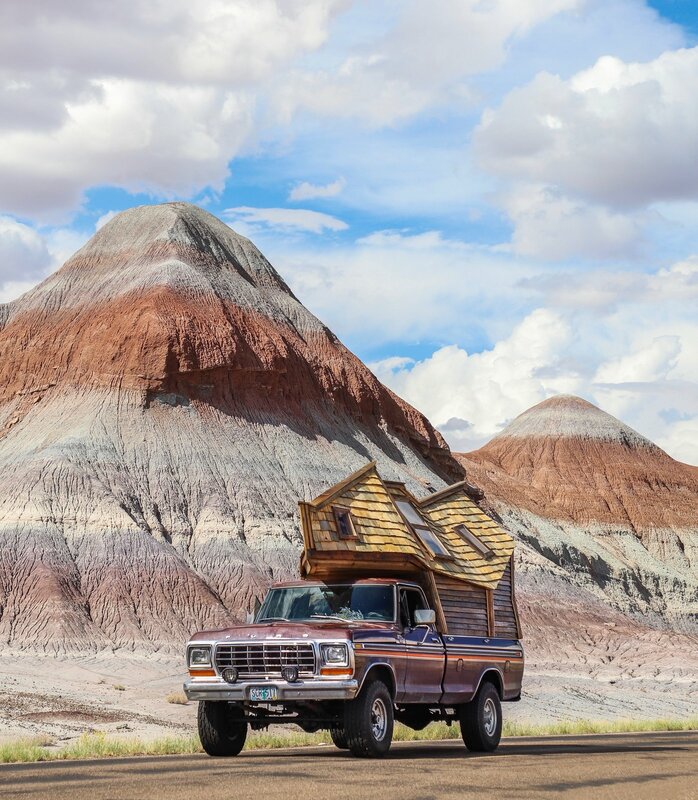 Witzling's sixth creation is the Truck Cabin, which he and his partner Underwood are using to tour the U.S. Right now, Witzling and Underwood are in the process of purchasing land in the Pacific Northwest, where they plan to build what they’re tentatively calling CABINLAND. "On this stunning property with trees, creeks, and views of the mountains, we’ll be building around six unique cabins connected by an intricate trail system that runs throughout the property," he says. "It’s ironic that the surge in the popularity of cabins has been brought on by technology," says Witzling. "Social media and smart phones have made millions of people—who weren’t previously aware that these types of homes existed, or that this lifestyle was possible—thirst for a slower life surrounded by simple, beautiful things." 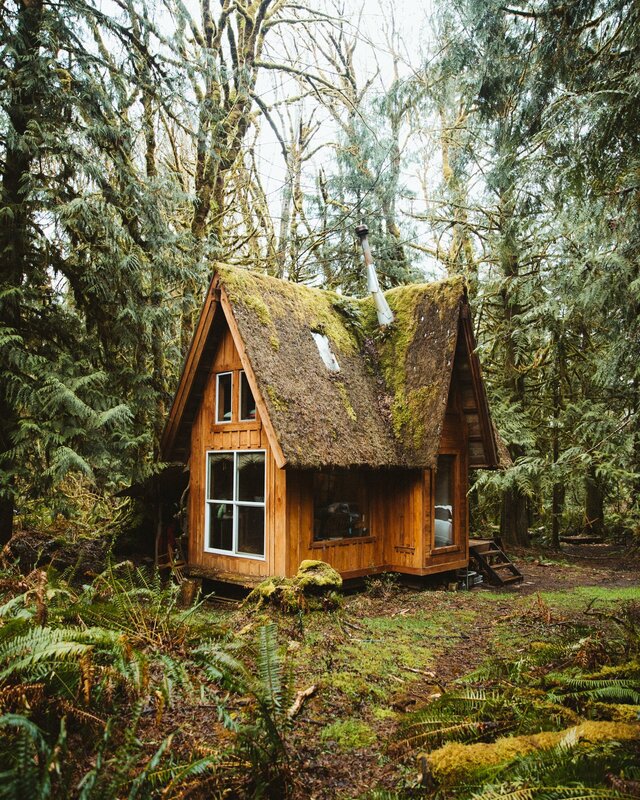 The way Witzling sees it, cabins embody beauty and simplicity that’s often lost in the hectic urban world. 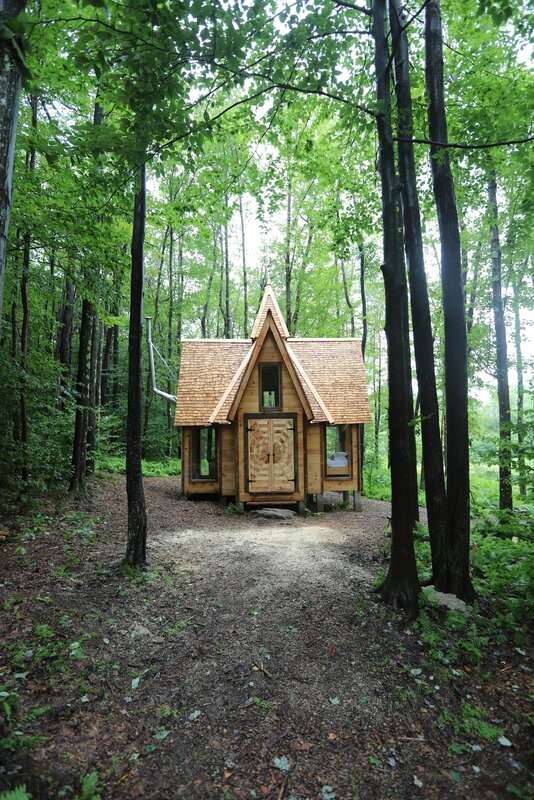 Below, we take a look at the whimsical cabins of Jacob Witzling. Built with a 100-percent salvaged materials, this cabin even features nails and screws gathered from job sites, garbage piles, and a local reuse store. The first cabin Jacob built. 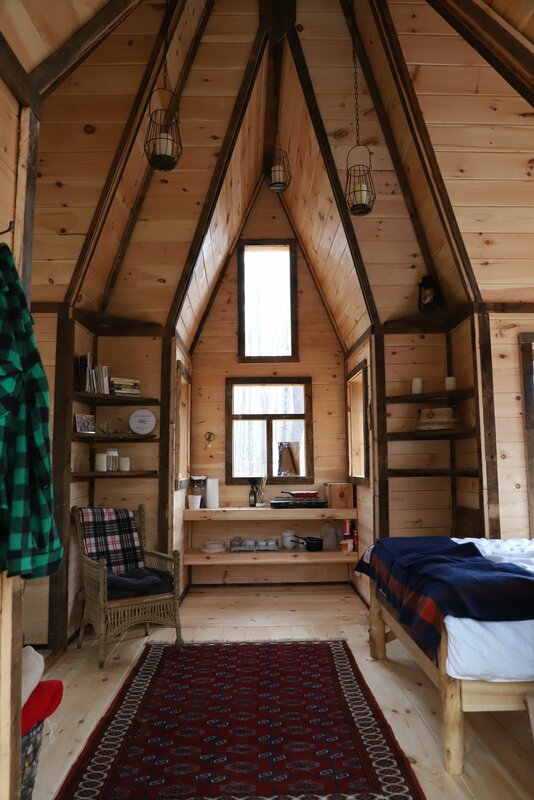 This cabin has a 100-square-foot lower level and a 70-square-foot loft. The cabin has a shed roof that rises as high as 22 feet. Built with wood salvaged from a dilapidated warehouse, this cabin has a 200-square-foot cruciform base and a 90-square-foot loft. The roof insulation is rigid, waterproof material that Witzling placed on the outside in order to leave the roof framing exposed on the inside. The metal roof has a layer of chicken wire, with moss harvested from the property stuffed into it to create a weathered-looking green roof. It has two ridges that intersect perpendicularly. 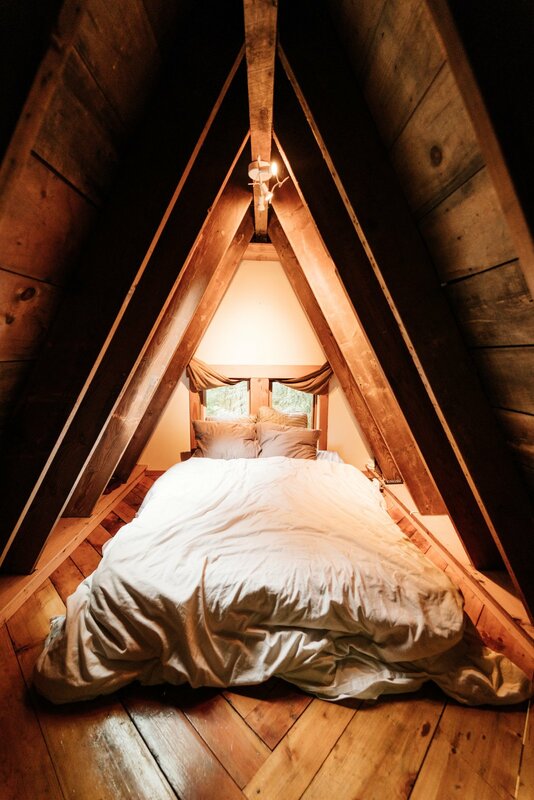 This cabin has a 135-square-foot octagonal base and an octagonal pyramid roof. It was built with plenty of help from Witzling's lifelong friend Wesley Daughenbaugh. "I used the same roofing concept on this cabin as I did with the second, covering it in metal, chicken wire and moss," says Witzling. A roof plane with a ridge protrudes to form eight 72-inch-tall dormers that run directly into the valleys. "The roof design was an eccentric experiment that would later become the inspiration for the roof of the truck cabin. This cabin was made with help from my brother Ethan Hamby," says Witzling. Witzling's life partner, model and actress Sara Underwood, explores Cabin 4. Set on an 80-square-foot irregular pentagonal base, and built with 100-percent recycled materials, this cabin is 17 feet long, 11 feet tall, and seven feet wide at its widest point. 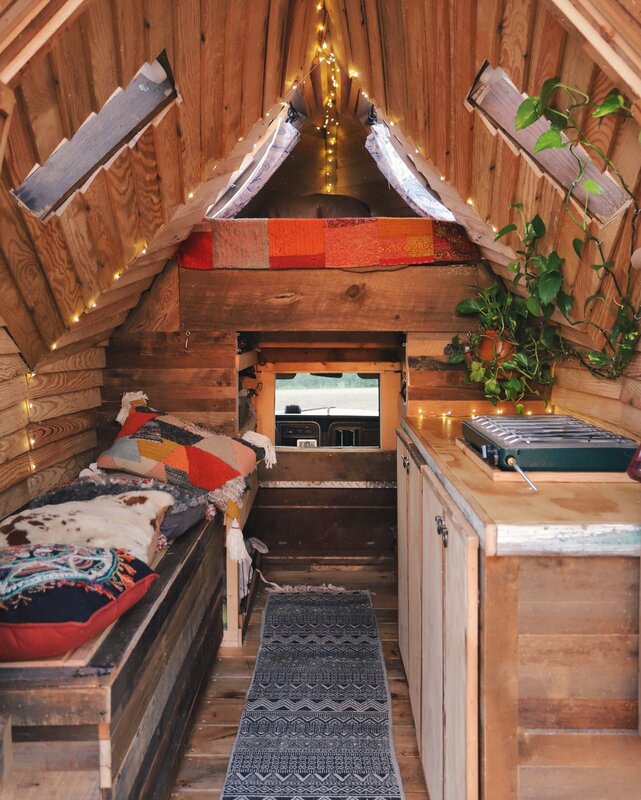 It has a small, 30-square-foot loft. 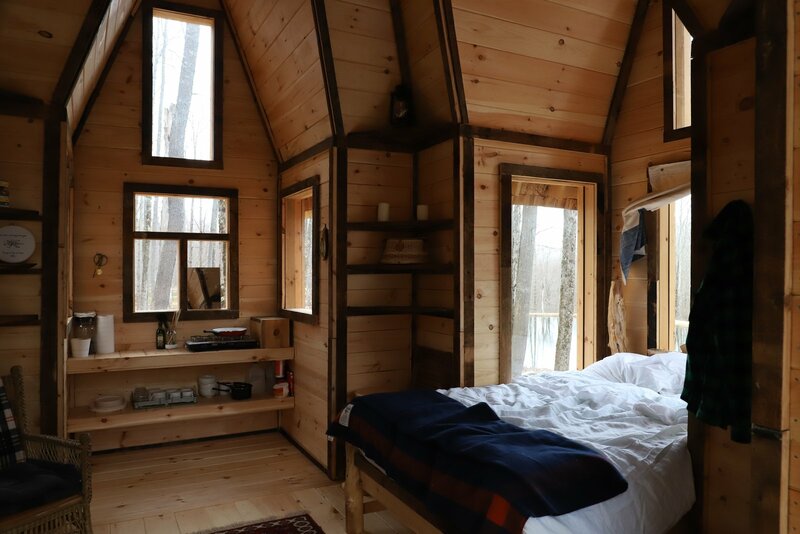 Built on a 200-square-foot base with 25-square-foot alcoves on each side, this cabin was built with help from Witzling’s brother Ethan Hamby and his childhood friend Scott Pearson. The 31-foot cabin includes a four-foot spire. It was built with wood that was salvaged and squirreled away from deconstruction jobs. 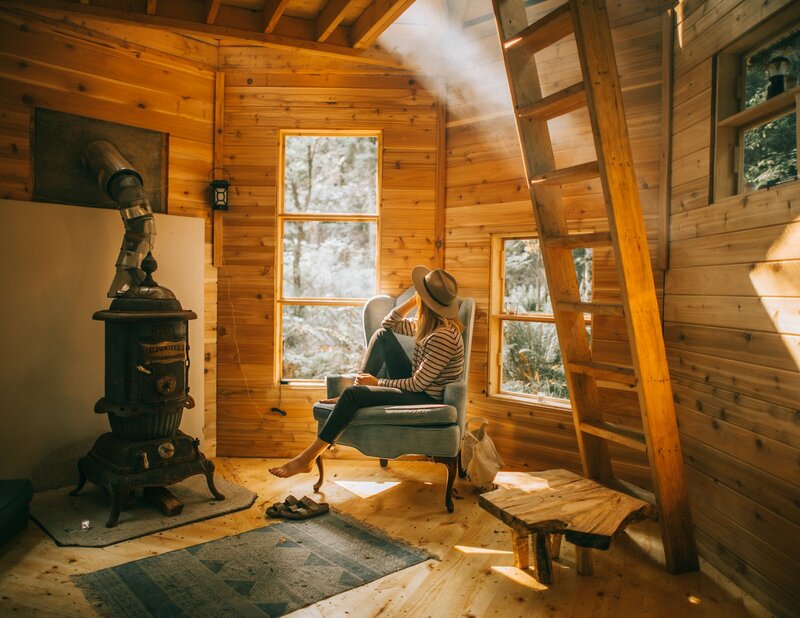 Built on a 1979 Ford F-250 with help from Witzling’s partner Sara Underwood, this cabin has a 40-square-foot base, and a 20-square-foot loft. "I designed it to have as few right angles as possible, so that it would cut through the high winds on the freeway, but also look unique," says Witzling. 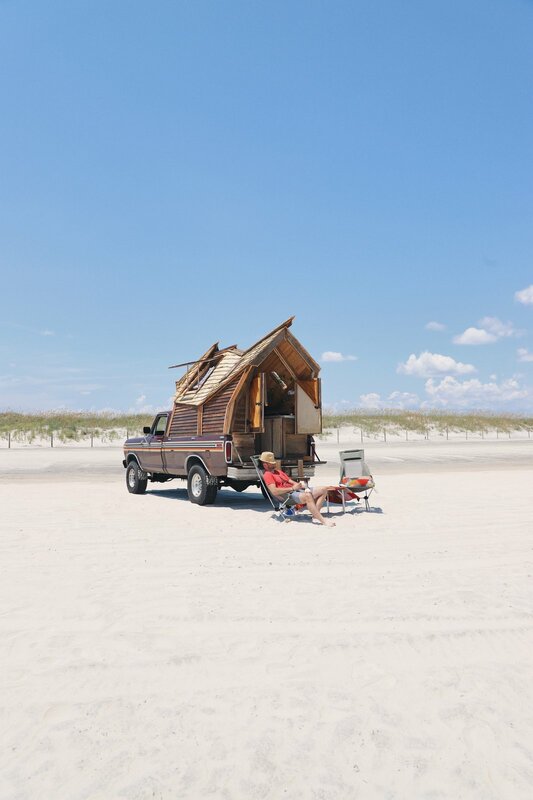 Made mostly with salvaged wood, its aerodynamic roof and sides serve as wind breaks. For more exceptional cabin inspiration, head to this off-grid prefab cabin in a Turkish village.